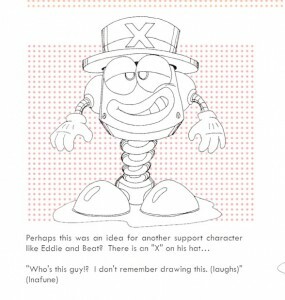 This time, we’re looking at previews of the X series. The first news of a Super Mega Man came early in 1993, but the first actual looks the video game press received at what would become Mega Man X was at the Summer CES that June. Demo images included a white city stage with many familiar but different elements from the final game. 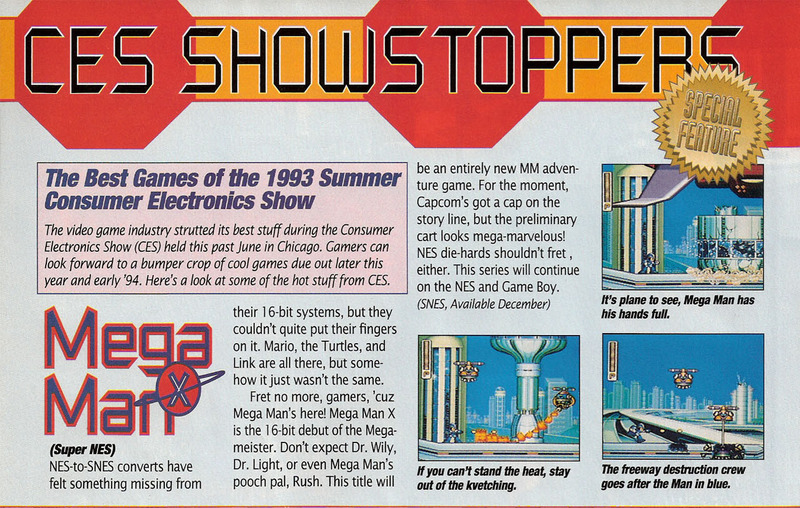 Nintendo Power ran this preview in their July 93 issue. Here we see three screens of the white city action, featuring the mini-boss RT-55J and an older version of the Death Rogumer. 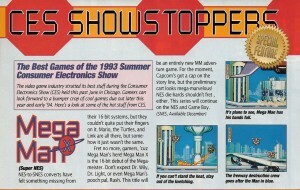 Gamepro followed with their CES coverage in their August issue, and then continued the story with a larger in-depth preview with more screen caps for September. This one is perhaps the most significant, because it includes screens, plot details and artwork for the game’s work-in-progress. In their screens you can find an unused flying enemy that emits flames. The newer screens look much more like the final version save some minor details, such as still using the “P” symbol on the lifebar instead of an “X”. The early concept of X’s armor is very interesting, with its Casshan-like mask, its ornate shoulder armor, its slender buster and intricate detailing on the legs, chest, and helmet. 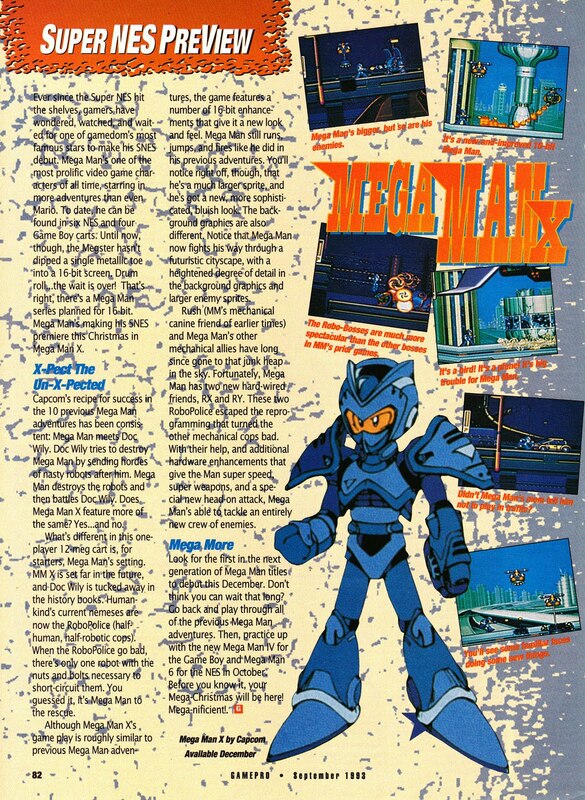 This image can also be seen other magazines, like the GameFan scan provided by Mega Man Network. The below image from Winter CES 1994 shows a large mockup of a similarly early version of X, and helps us imagine what this armor might have looked like in color (pretty similar to the final version, really). According to that, Capcom USA vouched that these were indeed plot details, and must have been changed over the course of game design (though how well Capcom USA was informed about the game’s development in Japan might come into question). Is there any evidence that these were really being considered? 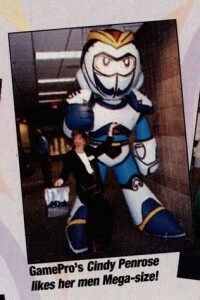 And the RoboPolice? 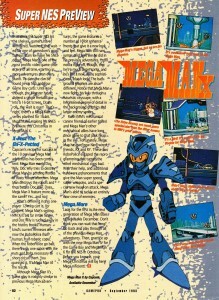 Probably just an early idea for what to call the Irregular Hunters, before they decided on “Maverick Hunters.” This one was actually very commonly used in previews right up until release, like in this page from Game Players’ November 1993 issue, which was based on an early English-scripted version of the game. 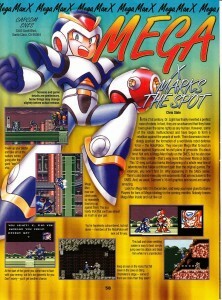 Even after the game was released, some sales advertising continued to use RoboPolice instead of Maverick Hunters, like the one from Chips & Bits seen below. One thing you might have noticed, these magazines seem to make the assumption that the titular hero in Mega Man X is the same character as Mega Man, only far into the future where Mega Man is the only one to have survived. 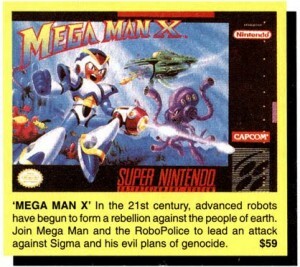 Some also imply that the X itself is the roman numeral for ten, making it Mega Man’s 10th adventure. 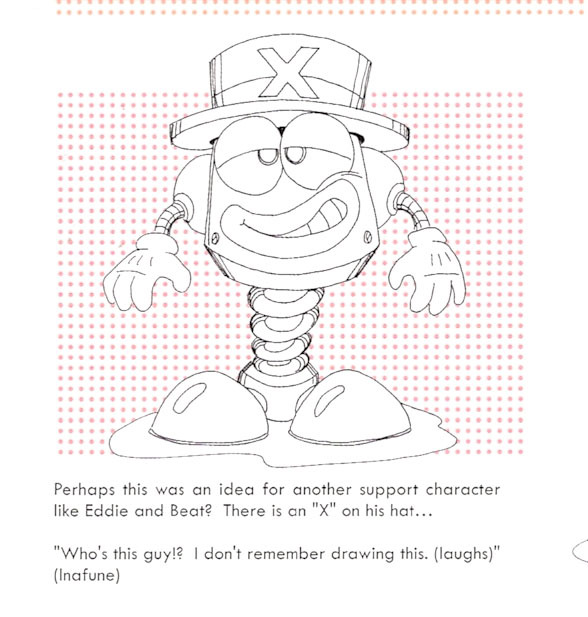 Capcom’s Laurie Thornton (the same source of the early X plot details above) sent out a different message in Gamepro #64. Even so, neither of these notions really ever left the English fanbase entirely, and continued to be popular for years. That’s all for today, but we’ll continue our Retromags adventures tomorrow. See ya then! 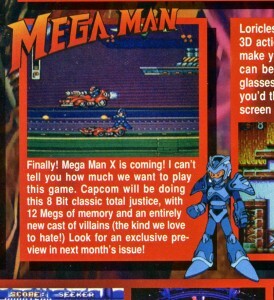 1 Trackback to "Retro X"
3 Comments to "Retro X"
Hahaha, I totally cringed each time I read someone in those articles refer to X as simply "Mega Man", but I can understand the confusion if it's totally new and such. I mean, this is the first time there's ever been another series besides the Classic series, and Capcom seemed to have been keeping a lid of a lot of the details for the story. Anywho, this was a very interesting read. I really enjoyed realizing how similar X's first ultimate armor is to Casshan/Casshern's armor, especially since the original Mega Man was partially influenced by him. 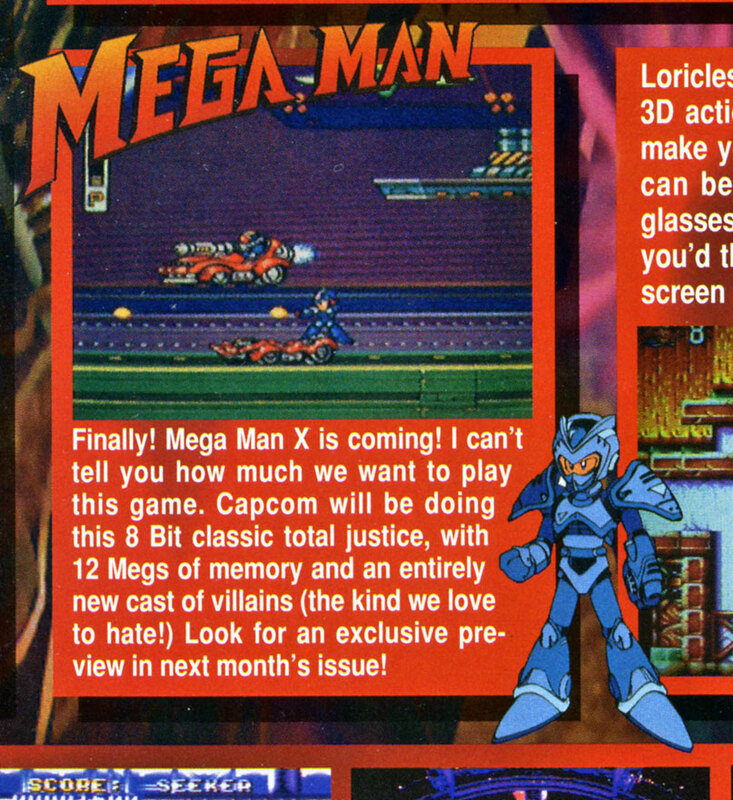 Gee, no wonder I spent years dispelling rumors and misconceptions among the Mega Man fan base, if the magazines were that inacurate. I hadn't seen most of these before, and it just goes to show that a game can change quite a bit before it's initial announcement and the final release. But then, at the time, I guess such concepts were relatively new to games, with but a few exceptions. Sonic was always Sonic, Mario was always Mario, Ryu was always Ryu… and the only exceptions I can think of were, at the time, one-offs: Castlevania III and The Legend of Zelda: A Link to the Past, both of which were a little more clear on the matter.